In case you haven’t noticed, the way we make buying decisions has changed. We are relying more and more on what others say about the products and services we’re interested in buying. In fact, about 90% of consumers claim that reading a positive review influenced their decision to buy. So if you own a local business, you need to make a concentrated effort to get more testimonials for your website and more reviews posted to the online review sites. If you have lots of really powerful feedback from customers who love your business, then it’s going to convert more prospects to customers. Do you have a system for getting testimonials and online reviews? Most small business owners are grateful when they get a testimonial but never actively seek them out. But what if you had a way to automate your system for getting testimonials and online reviews? 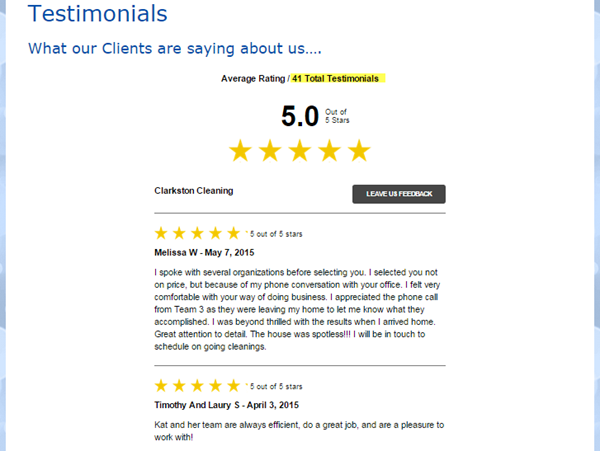 Dawn Raffler of Clarkston Cleaning in Michigan decided it was time to start getting more up-to-date reviews and to automate her system. So she signed up for More Reviews Now, and in about two months time, she had 41 testimonials posted to her website from happy customers! I you’d like the same results for your business, we can help. Below is a webinar that takes you behind the scenes of the More Reviews Now service. Simple setup, and simple process for asking for feedback from your customers. Are you ready to get More Reviews NOW? Click on the graphic to learn more about the More Reviews Now service. ← Think Getting Publicity Is Not For Your Small Business? Think Again!